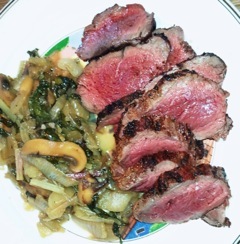 Yak meat is similar in flavor to lean, high quality grass fed beef. It is milder, though, having a cleaner finish on the palate. Yaks develop their fat layer externally, without the marbling found in beef. Connective tissue is easily trimmed. Typical cuts—e.g. sirloin, ribeye, tenderloins, roasts, ribs, stew meat, ground--are the same as with beef. Yak meat is lean yet juicy. Steak cuts are best prepared and served rare to medium rare. A little salt and pepper is all that is needed. The juiciness and the fresh, clean flavor don’t require masking with strong spices or marinades. Some cuts are exquisite when braised-- the connective tissue breaks down, and the meat falls apart. The juices produce the most incredibly rich and flavorful broth! Those who enjoy organ meats will find that yak heart makes beautiful tartare, or can be grilled on high heat to medium rare, sliced into strips, and served like steak. If you are fortunate enough to live near a yak breeder, be sure to ask about their meat availability. After you have sampled several different cuts of yak meat, you will probably choose it over beef. A few years ago, our Yak Meat Nutrition Committee collected nutritional data. 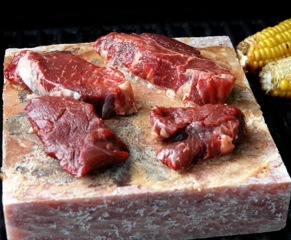 Samples from three different cuts (ground, round, and ribeye) were donated by various farms across the U.S. in order to represent different geographical regions. These samples were analyzed by Silliker, and IYAK received its first Certificates of Analysis and USDA recognized Nutritional Labels. The Committee submitted the data to a meat scientist, Christina A. Mireles DeWitt Associate Professor, Food Science Oregon State University. She perform a study comparing yak with other types of meat. The Summary Report concluded that yak meat is nutritionally very similar to grass-fed beef and bison. It is higher in moisture content, though, which is why it is so juicy. It is high in “good” fats, low in “bad” fats, and full of nutrients, so smaller portions often feel more satisfying compared to other meats. The data from the Committee’s work that year are available for you to view. Look it over, then find a yak breeder in your area and enjoy the delicious flavor firsthand. Below are the results of the International Yak Association's analysis of three cuts of 100% (fullblood) yak meat: Ground Yak, Yak Ribeye, Yak Round Steak. Samples were collected from a number of producers. The samples were all from grass-fed and grass-finished animals. These labels are for informational purposes only. IYAK is in the process of developing guidelines for the proper usage the labels. Until such guidelines are published, use of these labels on any yak meat is strictly prohibited. Danielle Gardner is one of the owners of Pettee Ranch, is a small local ranch that raises North American (originated from Tibet) Yak for all purposes including; fiber, meat, breeding stock, and beast of burden. We pride ourselves on being good stewards of the land, using grazing dynamics to aid in the health and function of the ranch as a whole, creating healthy happy yak.